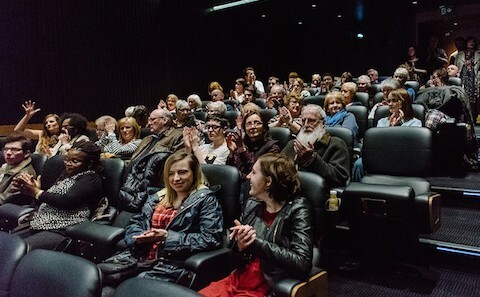 The pilot scheme enabled Glasgow Film Theatre (GFT) to develop the tools, knowledge and methodology to deliver a high quality, engaging programme of film for deaf and hard of hearing audiences. At the core of this programme is a holistic approach to access, which included training, access technologies, social activity, BSL interpreted and Speech to Text reported discussions and participant feedback. Legacy outcomes; Visible Cinema is now collaborating with the Royal Conservatoire of Scotland’s BA Performance on bespoke short Deaf film screenings facilitated by Deaf artists who curate and host the event. 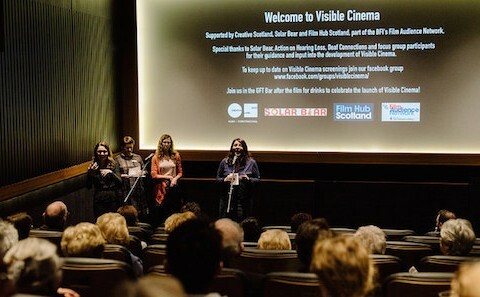 Visible Cinema primary focus is to increase representation of the Deaf community within audiences, however the project is also committed to increasing and discussing on-screen representation of deafness. For example, in March 2016, we were the first Scottish venue to screen Power in our Hands, a compilation of historical BSL archive footage of the Deaf community. GFT was the only cinema venue nationwide to host a school screening and it proved to be a great success; we attracted a first-time GFT audience of 54 deaf and hard of hearing P7-S2 pupils and their teachers attended and the post film discussion hosted by a British Deaf Association Heritage Officer and incorporated a Q&A with an older profoundly deaf couple. This garnered some wonderful intergenerational discussion and later that same day, we hosted a sold out public evening show, which was provocative and politically charged. GFT staff and volunteers have been given confidence and skills through Deaf Awareness and BSL training to better meet the needs of deaf audiences, Marketing staff have developed new, effective communication routes using social media and programming and project staff have developed understanding of the ‘Deaf Calendar’ and maintained programming at accessible, social times and encouraged a social aspect. These are just a few of the many ways that knowledge has been developed within and between the project partners through delivery of the pilot. The programme provides the opportunity to elevate aspiration and showcase positive representation of deaf and hard of hearing people artists/maker/creative within the creative screen industries. A key part of the programme are post-event screenings and dicussions – both formal and informal - encouraging and nurturing confidence and empowering often socially disabled people and communities. I feel like this is what going to the cinema will be like in the utopian future I dream of! Visible Cinema is a fantastic idea. I love the idea of regular captioned/subtitled films, old and new. Mixing with other groups of people including Hard of Hearing etc. Can’t wait for more of the same. Nice for our community to have more options rather than a limited choice of what we can and can’t see. Karen Forbes, previously Training and Learning Manager at Solar Bear said: “This initiative will make cinema going more accessible. 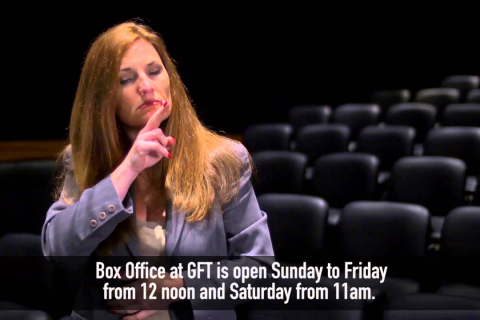 It is fantastic that GFT recognises the need for more captioned screenings and are aiming to make this art form more accessible to the deaf community. We look forward to working with GFT and Film Hub Scotland in the future as they look to expand captioned screenings to independent cinemas across Scotland"
Leonie Bell, Director of Arts and Engagement at Creative Scotland, said: “There is a need for better provision for deaf and hard of hearing cinema-goers and it’s great that this gap has been identified and steps taken to provide support for deaf and hard of hearing audiences. The film club will use the introduction of British Sign Language interpretation into mainstream timeslot screenings, and explore new technologies such as live captioning. We hope this will open the world of cinema to deaf and hard of hearing audiences and allow them to experience and enjoy the true magic and power of cinema without barriers." Scots magazine - “850,000 people are deaf or have hearing loss in Scotland so this new venture will be a welcome diary date for many”. The List - Visible Cinema will enable the GFT to deliver a high quality programme of films for this demographic that includes captioned, subtitled and British Sign Language (BSL) interpreted screenings, as well as BSL-interpreted post-show discussions.